What if you were driving a desolate North Dakota highway in a hundred year storm, and the only other car on the road was…WRONG? This novella is frighteningly eerie and suspenseful. Peppered with similes that McDaniels excels in I enjoyed it immensely. 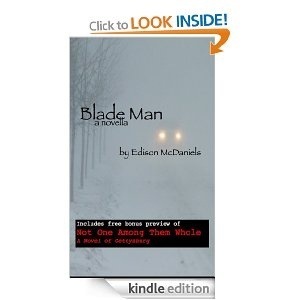 A scalpel blade salesman on the road who thinks he’s discovered a serial killer. I reveal no more as the rest you need to discover for yourself. I will say the ending will make you do a double-take. So plenty of twists to this unpredictable story. Wrap up warm in front of a fire for this gripping novella.